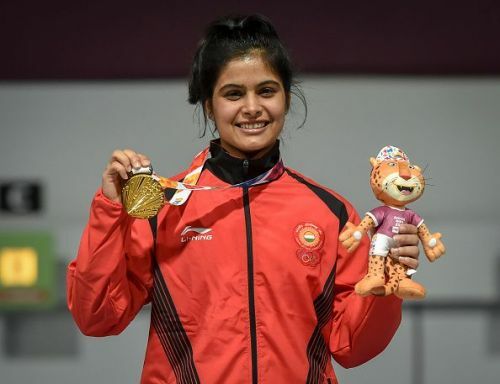 India’s star shooter Manu Bhaker scripted history as she brought home the country’s second gold medal from the Youth Olympics 2018 in Buenos Aires, Argentina on Tuesday. The 16-year-old became the first Indian shooter to clinch the yellow metal as she finished on top of the podium in women’s 10m air pistol event with a score of 236.5. Earlier on Monday night, weightlifter Jeremy Lalrinnunga won India’s first ever gold medal at the Youth Olympics. India has already won five medals from the third edition of the Youth Olympics, and looks set to register its best-ever medal haul. Team India started its campaign with a couple of silver medals through shooter Tushar Mane and judoka Tababi Devi Thangjam. India then went on to add two more medals on Day 2 when Lalrinnunga won a gold and shooter Mehuli Ghosh scooped up the silver. Day 3 started on a brilliant note for India with Bhaker adding one more gold medal to India’s kitty. In the two previous editions, India had missed out on a gold and had amassed a total of 10 medals -- seven silver and three bronze. Bhaker, who was the flag bearer for India at the 2018 Youth Olympics, topped the qualifications with a score of 576. She carried that momentum into the final and led Stage 1 with 99.3. Her scores did drop below 10 in Stage 2, which was the elimination round. But she managed to rebound and produced a 10.1 and 10.2 in the final series to clinch the gold. This was a smashing comeback from Bhaker, who had missed out on a medal at the Asian Games in August. The silver medal went to Russia’s Iana Enina for shooting 235.9 while the bronze went to Georgia’s Nino Khutsiberidze for a score of 214.6. India could add more gold medals in shooting as Asian Games gold medallist Saurabh Chaudhary will be in action in the 10m Air Pistol men’s event on Wednesday. Do you think Manu Bhaker’s performance will inspire Saurabh Chaudhary to win yet another gold medal for India? Do share your thoughts in the comments section below.